One Lady’s hobby becomes a fundraiser for the YMG Congo project! 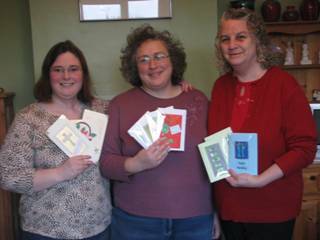 Catherine, married to Andrew and mother of three, (Ashley, Andrea and Kaitlyn) first started to make cards three years ago after attending a card making course with a friend. Just over one year ago Catherine (Left in picture) responded to a plea for help from Jane Baskerville (UK Director for YMG). Jane was collecting items to be sold at a car boot sale to raise funds for YMG. Catherine offered a box of her home made cards to be sold at the car boot sale and thought that was that! 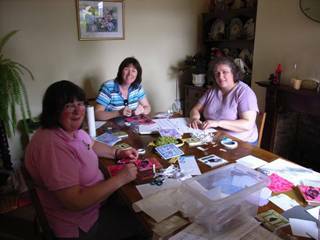 But the Lord hadn’t finished with her and her new found gift, Catherine found herself making more and more cards and encouraging her friends Chris and Rosemary (Right & Centre in picture) to join in with her. They beaver’d away making hundreds of cards and gradually found ways of selling them. They organised coffee mornings, 'make and take' parties, arranged sales at school fetes, local shops as well as personal individual sales to friends. Putting their Faith into action! Last year Catherine and her team raised £1000 for YMG Congo and have already begun a new year with fresh inspiration from the Lord about new designs and new ways of selling their cards. So far they have sold more than 2,000 cards on behalf of the work of YMG. I spoke with Catherine and asked her why she sold these cards for YMG. ‘I don’t have my own income in order to support YMG directly, so this is my way of contributing to this ministry. I do not see myself as an evangelist but, this is my way of enabling the efforts of those that do have that gifting. Many of Catherine's cards include scripture verses, and each one is different and beautifully made!